Contents: Preface. M.E. Maruish, Introduction. L.R. Derogatis, W.J. Culpepper, Screening for Psychiatric Disorders. L.E. 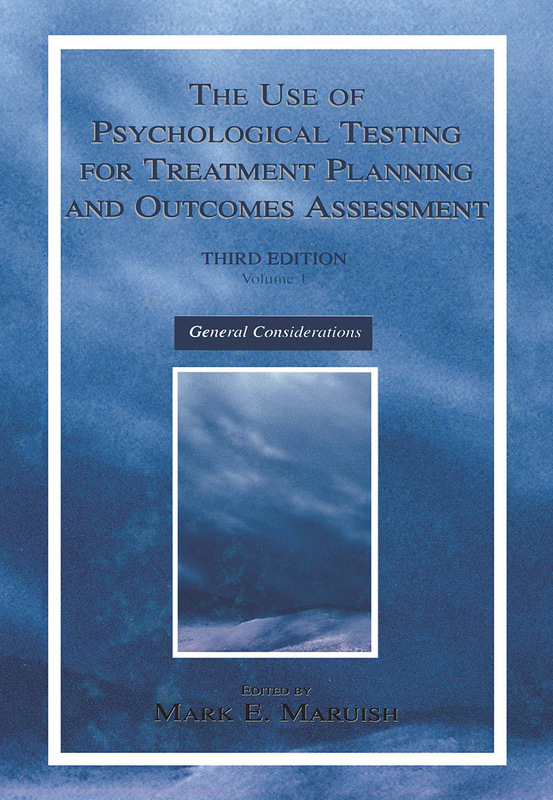 Beutler, M. Malik, H. Talebi, J. Fleming, C. Moleiro, Use of Psychological Tests/Instruments for Treatment Planning. J.O. Prochaska, J.M. Prochaska, Assessment as Intervention Within the Transtheoretical Model. M.J. Lambert, E.J. Hawkins, Use of Psychological Tests for Assessing Treatment Outcomes. F.L. Newman, D. Rugh, J.A. Ciarlo, Guidelines for Selecting Psychological Instruments for Treatment Planning and Outcomes Assessment. M.E. Maruish, Development and Implementation of a Behavioral Health Outcomes Program. F.L. Newman, S.E. Wong, Progress and Outcomes Assessment of Individual Patient Data: Selecting Single Subject Design and Statistical Procedures. F.L. Newman, M.J. Tejeda, Selecting Statistical Procedures for Progress and Outcome Assessment: The Analysis of Group Data. J.D. Cone, C.J. Dahlberg, Ethics Concerns in Outcomes Assessment. J.S. Lyons, J. Helgerson, K. Fawley, Future Directions in the Use of Psychological Assessment for Treatment Planning and Outcomes Assessment: Predictions and Recommendations.